I had been wondering where the line, "There are eight million stories in the naked city, and this is one of them..." came from? I was thinking about it and noting that the same thing is true in the country. It's on a different scale, but everyday so many things happen, little things and big things, things that take our breath away, things that compel, delight, or make us scratch our heads and wonder. There are more stories than we can tell, so most of the time we don't tell any of them at all, not about the goldfinches that gather in throngs under the birdfeeder and fly off in unison at any imagined hint of danger, nor the abundance of raspberries on this year's canes, or the way the moonlight pours through the skylights and makes night into day. There is a poem or a post in everything we see, but we don't write it down or photograph it, we just notice. Roger was walking from the sauna, around the house to the gate when he noticed something fall or fly from the garden-hose caddy to the ground. 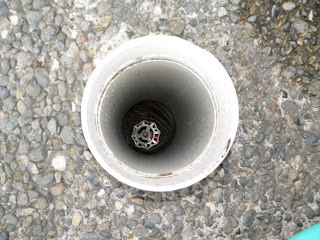 He assumed it was a bird, but when he went to investigate, he found that it hadn't exactly fallen to the ground, but into the valve tunnel for the outside sprinkler system. 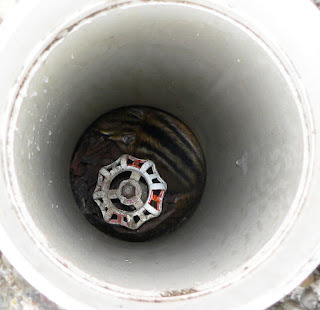 He grabbed a flashlight, and saw there 18 inches below the surface a little chipmunk, scared and trapped. Okay, now what? We didn't want to put our hands down there and try to grab the little thing, even with thick gloves on. I googled "rescuing trapped chipmunk" and read one account where a chipmunk bit its rescuer all the way through leather gloves. We eventually settled on putting a piece of pruned wood from one of the fruit trees down into the hole. We figured the chipmunk would have to know how to climb up and out on such a familiar piece of bark. I waited a while with the camera ready, but it was not going to oblige me my timetable. So, I left, walked to the mailbox, talked to the neighbor about rescuing chipmunks, and when I returned, it was gone. Yay! It's just one little story, but one that took some of our time and attention on Saturday. On Sunday, we had a moment of reckoning with our real estate agent and came to a mutual agreement about cancelling our listing agreement. I would have hated being on the receiving end of the letter I sent to her. I don't pull punches, and I am very straightforward and to the point when I am disappointed. So, now we start all over with someone new, or not. Perhaps we'll just try to sell it ourselves. We don't know yet. 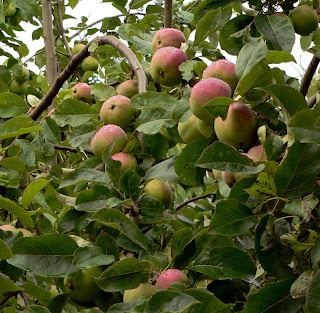 At least the apples in the orchard are abundant and beautiful this time of the year, aren't they? robin and i were looking at the tide tables on tuesday eve. 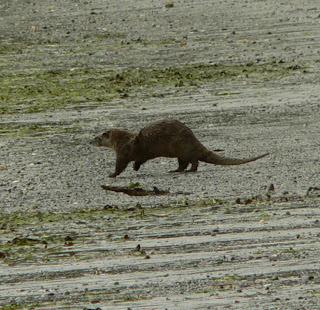 we like to walk the shores at low tide, poking around among the rocks and pools to see what's there. wednesday's low tide of -0.3 at 8:39 am was not as interesting as the -2.1 coming on 7/29, but was certainly low enough for me to find a clam or two. 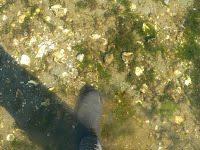 i found 10 clams fairly quickly, though i did have to dig more holes than other times to get 10. enough for a meal. 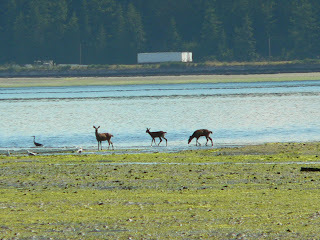 i wandered off to check out the rest of the low tide area. 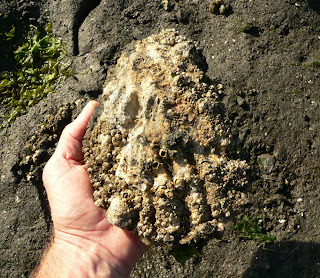 walking upstream along the meandering low tide channel of chimicum creek i came upon a large oyster. i mean BIG. 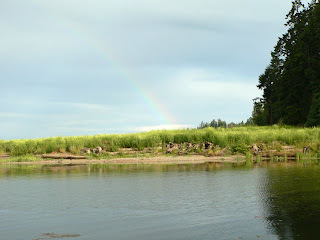 so i hustled back to the car to drop the bucket of clams and shovel and grab the camera. this is a pacific oyster, Crassostrea gigas, imported from japan in the early 1900 hundreds. not this individual of course, but its ancestors. 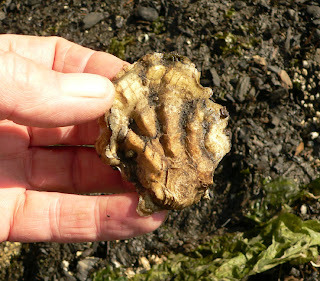 the native oysters had already been over harvested to the point of collapse by then. 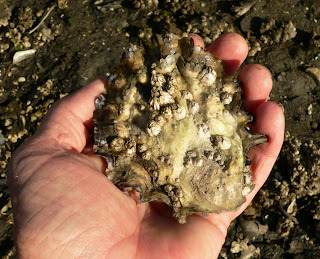 the minimum size for legal harvest here is 2.5 inches, because the native oysters rarely get that large, and the state is working to restore the native population. this one is possibly legal, and could be either species. 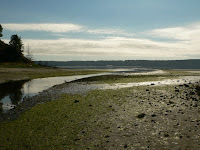 this is a view of the tidal flats and the low tide channel of chimicum creek. the strong sunlight in the early morn made the camera produce this kinda moody view. the big oyster was found somewhere in the near foreground. that is sticky, sticky mud. there is no middle view out here. just the small world at one's feet, or the broad expanse of flatness. i am standing in water 10 inches deep here. i love the clarity of the water. we did do more house readiness stuff too. but it was boring. we also took a nice walk in the forest at fort worden state park. that was not boring. robin took some nice pictures and may post them soon. don't forget to submit pictures for good planets by friday to sbgypsy AT hotmail dot com. In the middle of everything Tuesday, we harvested these four heads of cauliflower, cut and blanched them, and then froze in batches. Yum for the future. Then it was back to the tasks at hand. Roger mowed the back lawn and I gathered spinach in the garden. When I came back into the yard, something caught my eye. The window seemed to be covered in the most beautiful spider web. At least that's what my brain wanted to do with the suddenly spectacularly shattered glass. The mower had shot a rock straight into it. Perfect shot. We've been off on a million tangents because in all things real-estate related, one thing always leads to another. Imperfections are primed, painted, polished, and primped. It's what we do now. See that faucet, make it shine. See that weed, pull it. What's with that dusty surface, that lint on the bedspread, the water spots on the mirror, bits of fuzz on the rug? Banish them at once. Our house is now in a liminal stage. We live in it, but the house exists on the internet with a life of its own. It is reaching out to prospective buyers. It is trying to entice people with its sun-infused skylights, its expansive space, its beautiful gardens. We merely tend to its needs. Master and servant have traded places. The house commands. We obey. We did permit ourselves the time to watch the Democratic debate on CNN, and were quite impressed with the format. I think our fellow citizens ask much more inventive and smart questions than the journalists who are typically given that high honor. It was refreshing and interesting to hear people like you and me ask the things that are on our minds. I suddenly felt encouraged to make a youtube video for the Republican debate. I have few questions I'd like to ask them-- about habeas corpus, executive privilege, checks and balances in the three branches of government. How about you, if you were going to ask the Republican candidates a question, what would it be? Other than that, it's been rainy and cloudy for over a week, much like the endless winter only warmer. The garden is pretty happy about it though, giving us substantial bounties of cauliflower, broccoli, spinach, and lettuce. We've frozen a lot of pesto and raspberries too. Did I ever photograph things that were not house related? Hard to imagine. we are in throes of the last.....oops, that metaphor has been (mis)used fairly egregiously not so long ago. it is wednesday evening as i write this. tomorrow is the realtor's tour of new listings. our agent will arrive by 8:45 am. we will clear out, to return at noon. so in the previous week we have neatened and weeded and painted and etc, etc, etc......ad infinitum. we are such slobs. the place does look good tho. 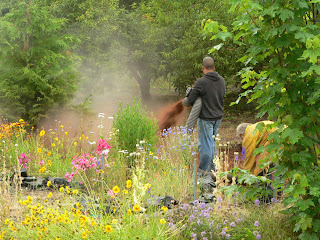 the new hi-tech way to spread bark mulch is to have it blown in. kinda like insulation. this huge, pristinely white truck pulled in today about 9:30 am. it was drizzling then. 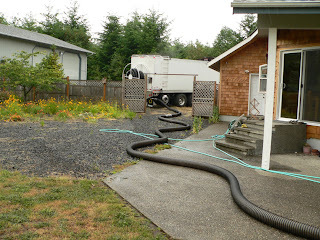 the delivery guys unreeled a bunch of 4 inch flex hose and in an hour and a half sprayed out fifteen yards of mulch, which covers a goodly area 2 to 3 inches deep. we could have paid a bit less to have that much mulch delivered and dumped in a pile. my wheelbarrow holds about a third of a yard. 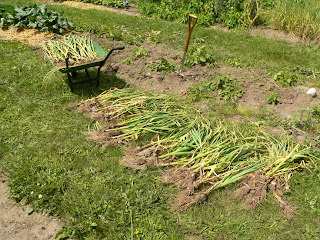 forty five times loading the barrow and moving it, dumping, and spreading the mulch. oh, as we say, my aching back. the business end of the mulch blower. 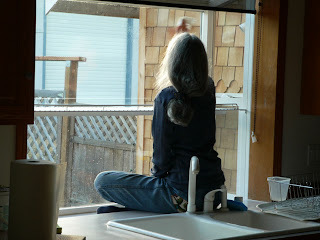 robin cleaned all the windows, inside (obviously here)and out. some required a bit more agility than others. so, the plan for tour day, for us, is to go to the corner cafe (this is a rather hip sorta rurality) for croissants and eggs and free wifi. there goes more than an hour. then into town to the great used book store. a bit of food shopping at the coop. wine from safeway (the evil capitalists offer a very nice discount on a six-pack of mixed wine). then back to our normal life of hyper-vigilant cleanliness and neatness so as to be ready for prospective buyers to ooh and aah at our good habits. is my attitude showing? we're tired. i posted a few days back about first impressions and many of you left such encouraging and complimentary comments. i did essay a reply early in the day to many of you; alas, i failed to copy and haloscan failed to record. my thanks to all. to address some points: we are hoping that someone who appreciates the greenhouse and the gardens and birds will want to live here. we enter and leave quite often thru the garage. we are humbly proud of our work shingling the exterior. the recipe is from (sorta, robin is good with indian spices) one of our madhur jaffrey cook books. 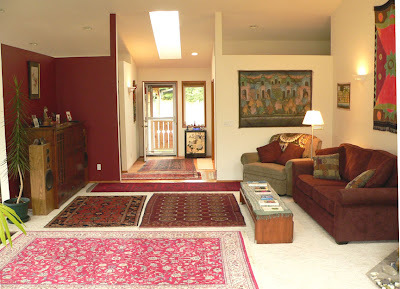 our VeryNiceRealEstateAgent doesn't do staging. i did not recognize the name carl larsson, but i did immediately remember the pictures. a style i like. mmmmm. pesto. we have 7 batches frozen. and the basil is again overgrown. FC is the datil go to guy. see above---no staging. what? us think? we are honored. we wouldn't think of being here when prospective buyers come to look. that's what agents are paid to do. junk? clutter? us? we will require garden space wherever we go, and look forward to trading garden lore with more of you. we will take our frozen food with us. don't know how yet, but we will. we're heading to humboldt county, ca to rent. then check out the area for a proper home. maybe up into oregon. somewhere on the coast. oh, dallas. probably not. we want to repeat the finding but not the leaving. try madhur jaffrey for recipes. not sure about old shoes. maybe as planters. we are honored to spread the datil tradition. herbs add to the taste of veggies. love the yellow squash. oh yeah. we will have to move. i'm off to check the fridge for goodies. i did get a bit cryptic above. 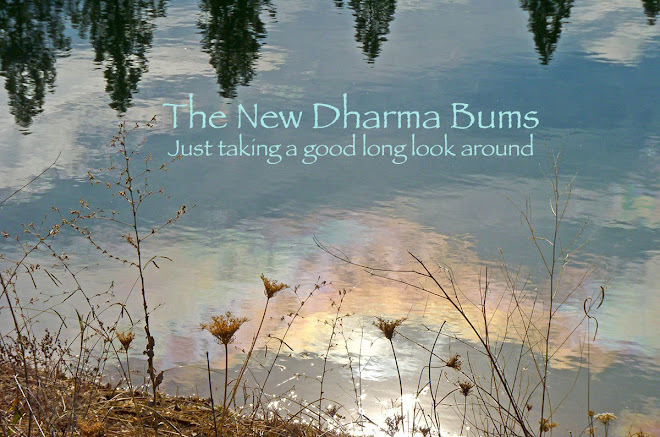 check the comments in the first impressions post for decoding my obscurantism. We put it on the table. our very nice real estate agent (did we mention that we're moving?) reminded us that the main entry is the first impression of the house. we don't go in and out this way very much, so we had not put our main energy there. the intention to create a welcoming entry was alive and seeking concreteness (in a metaphoric way), but had not been actualized. 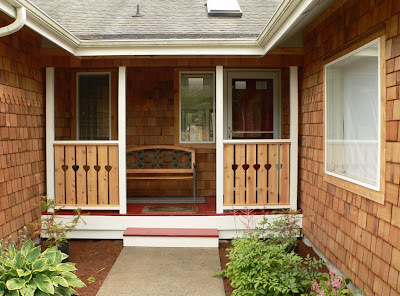 the floor of the porch pictured below had been finished with a sort of blue stain. not really paint. as we pondered the color choices of floor paint, our V(ery) N(ice) R(eal) E(state) A(gent), henceforth referred to as T, suggested "why don't you paint it the same red as the door." robin and i looked at the white door. so T, our VNREA, again said, "why not paint the porch floor the same red as the door?" doh. we got it. and agreed. too bad we don't have a before pic showing the four bare posts unpainted. no railings. no boards with a heart cutout. no red. even though we're planning to move we still have a vegetable garden. this is the best year ever here for us. we have frozen sugar peas in the pod and also shelled. 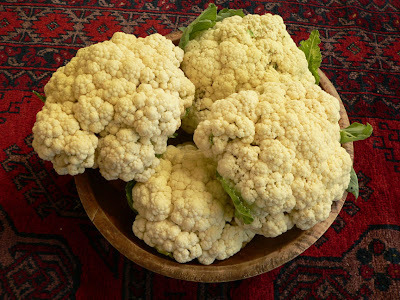 we harvested cauliflower and froze 7 quart bags of it. more to go. also broccoli and pesto. and more to go of both of those. 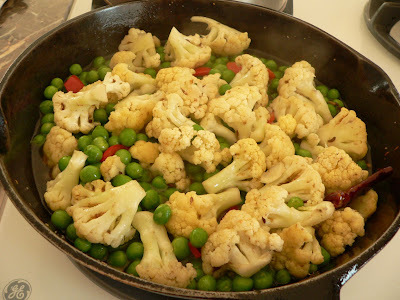 this is a melange of cauliflower and peas. the bits of red are red bell peppers. on the right is a dried hot pepper. splash (carefully) some nice olive oil into an iron skillet. saute fenugreek, fennel seed, cumin seed, and whole dried red pepper. add the cauliflower and peas and ground coriander. saute for another 8 minutes. add a bit of water and cover. cook on low heat till done to your taste. 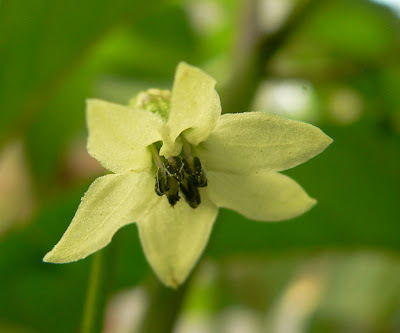 a datil pepper flower in the greenhouse! from the famous st augustine family of our internet pal FC. thanks for the seeds. we are honored to spreading his family tradition. 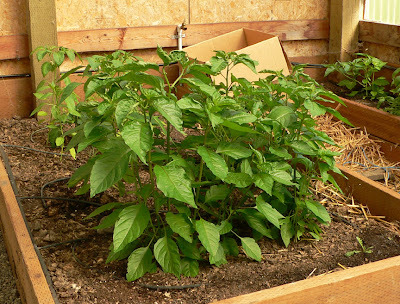 the whole datil pepper plants, with red bell peppers in the back. 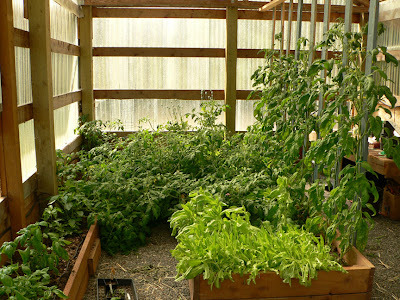 in the lower left, basil; all across the back and right, tomatoes; the lighter green stuff: several sorts of lettuce. while we're still here we eat well. Doesn't it just figure that the week we decide to get the house ready to put on the market, the temperatures soar off the charts? Did we make the gods angry or what? Seattle hit a record-breaking 98F on Wednesday. I was out painting the front porch and cursing all the global climate change naysayers. No wonder everyone says hell is hot. It certainly felt hellish to me. 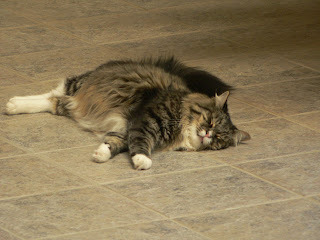 Our kitty cat Bonsai found the coolest space he could, stretched out on the tile floor. No such languid stretching for me or Roger, it's all work work work. 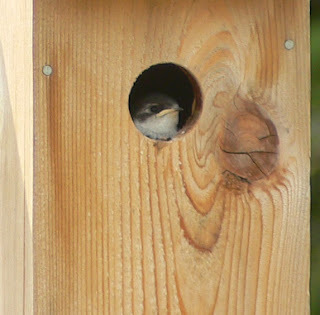 While I was painting the posts on the south side of the house, I noticed a little someone watching me. I wonder what Blanche's little nestling makes of all this crazy activity. This little one is quite the charmer. 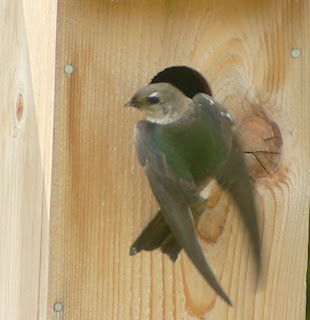 She only hides when we let the cat out, or when other juvenile Violet- green Swallows come and do fly-bys. Her parents are so good to her. They fly around all day long bringing her all sorts of yummy insects. 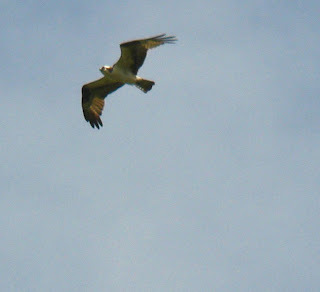 I've seen them out at dusk, swooping and swirling, catching the last of the day's meals. While I was photographing the baby, beautiful Blanche came by and brought a snack. I think she is really looking good, and she's turned out to be such an attentive mom. I hope she comes back next year. If all goes well, we won't be here, but it's been a good yard for her to successfully raise her offspring. While we're out working, I'm always looking around, but I also listen to Air America on the radio. I'll say this: The talk almost all day on Thursday was about impeaching the President. It was serious talk, and it was hard not to do a happy dance up on the ladder, but I was definitely only dancing on the inside. 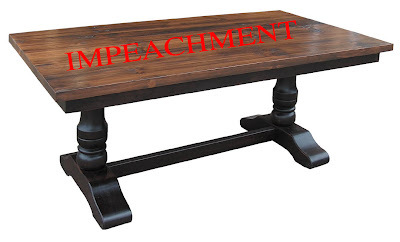 I heard someone say that the President doesn't even have to break the law to be impeached. He just needs to be incompetent. I think Bush has long since met that benchmark. It's past time to go, George, and please take Cheney with you. Everyday that you are in office I miss my good county and my Constitution. And, finally, I know I've been remiss about Good Planets this month, and I apologize to SBGypsy who is hosting it. Please, if you have a beautiful photo that captures something special about our earth, please send it on Friday to sbgypsy AT hotmail DOT com. Thanks, everyone, and have a great weekend. One of the many things we love about Jon Stewart is that he ends his show with a "moment of zen." 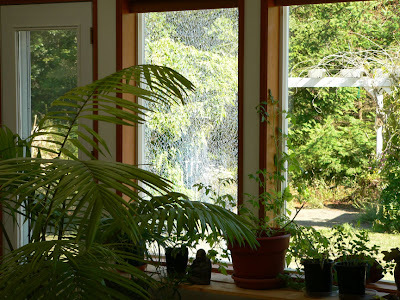 Such a great idea, one that we've incorporated into our lives, almost every time we go outside and take a look around. 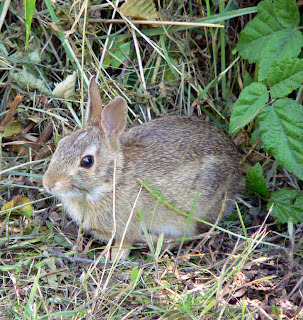 It's wasn't so much this small bunny we saw on the way to mailbox, which in and of itself was as sweet and unassuming as all bunnies moments are, but it was the sky reflected in the bunny's eye, and upon a closer look in Photoshop, Roger and me there too. It wasn't so much the bolted lettuce that should have been pulled weeks ago, long after the leaves were too bitter for the salads, but it was the hidden junco nest Roger found at the base of the lettuce plants when he went to pull them, and the innocence of three tiny eggs. 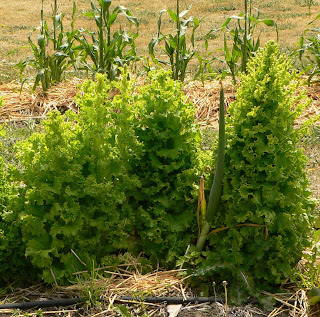 It's wasn't so much about going outside to photograph the bolted lettuce and the straw mulch that we spread around a bit to fool the raccoons and crows, but it was the osprey that sailed quietly over the garden, the lettuce, the nest, heading east to the bay. It was Roger catching the raccoon "red-handed" on top of the very heavy flat rock that creates the waterfall in our litte pond, after finding it crashed down into the pond three times, and replacing it three times. Do you think the raccoon did it, we had asked each other? It was yesterday's New York Times editorial calling for the US withdrawal from Iraq, and Frank Rich's op ed calling Bush "A Profile in Cowardice." Ah moments of zen shared with many readers around the world. It was the real estate agent coming into to the house the other day, walking through the front door into the living room, looking around and saying, "Very zen." Have you had any moments of zen lately? ...and we wonder at the incongruity of seeing deer at an extreme minus tide, among the herons and gulls at the salt water edge of our little world. And yes, we feel both discouraged and outraged by Bush's commutation of Libby's prison sentence. I hate my skin rash too.